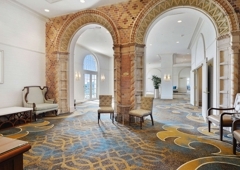 Enjoy the historic surroundings of the Hilton Baton Rouge Capitol Center hotel. Our historic downtown hotel is located near the Shaw Center and the Louisiana State Capitol, and three miles from LSU. Take the complimentary shuttle to and from the airport and within a five-mile radius of our hotel. Relax in our smoke-free guest rooms with views of the Mississippi River or downtown Baton Rouge. Take advantage of the complimentary high-speed internet access and comfortable work area, with decor reminiscent of the early 1900’s. Stay in an executive room or suite for access to the Executive Lounge where you will enjoy complimentary continental breakfast and evening cocktails and hors d'oeuvres. Savor Louisiana seafood and steaks in The Kingfish Grill, where governors and politicians have also dined. Hold your meeting or banquet in over 20,000 sq. ft. of flexible event space decorated with a historic, Art Deco design. 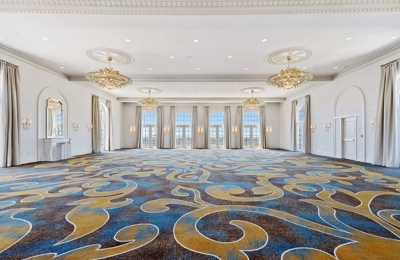 Our two stunning ballrooms offer breathtaking views of the Mississippi River and downtown Baton Rouge. Wonderful vist.. will definatly come back! We had a very pleasant surprise when we first walked into the Hilton in Baton Rouge. This hotel was very elegant and the staff was very friendly and helpful. It was an old abandoned buidling for several years in downtown Baton Rouge and the renovations are magnificent. We had a King Room overlooking Lafayette St. which was beautiful. There was no problem with noise, and the room was clean and well appointed. The towels were great and the rooms come with a nice flat screen TV and very comfortable beds. The location is wonderful it was easy to find and is only a few miles from LSU and is right next door to the Shaw Center, and the Capitol is only a few blocks away.The staff is so friendly and hospitable. You're not likely to find many really nice hotels in the area, but this one is a standout and the service was excellent.